August 25, 2015 /47 Comments/in Featured Articles, White Racial Consciousness and Advocacy /by Andrew Joyce, Ph.D.
Christian Mayerhoff, PEGIDA Spokesperson, January 2015. As the show came to its conclusion I found myself reflecting on an earlier taboo-busting confrontation involving Duke, and the broader implications of decisions to silence discussion of negative Jewish influences on our society. We are all well aware that this topic is off-limits in mainstream discourse. What I am instead referring to is the taboo as it exists in the alternative sphere, specifically in the political and cultural expressions of White advocacy. To point to just one well-known example, it’s now more than nine years since Henry Wolff penned “Jews and American Renaissance,” discussing the role of Jews in the White advocacy movement. I acknowledge that AmRen plays an important role in the White advocacy movement and that it is quite possibly good strategy to encourage several strategies rather than put all our eggs in one basket in a situation where no strategy seems particularly effective at the moment. Nevertheless, Wolff’s brief apologetic is worth discussing because, if true, it would have implications for the broader White advocacy movement. Wolff argued for the untroubled participation of Jews in the White advocacy movement, and for a move away from an allegedly ill-founded, harmful and counterproductive focus on Jewish influence. The article appeared in the aftermath of the now-notorious 2006 AmRen conference during which, according to Wolff, “one participant” allegedly told a Jewish conferee that Jews were not welcome. I concede that I wasn’t present at the conference, but in the footage that I have seen no such statement is made. It’s now common knowledge that David Duke, rightly or wrongly depending on your perspective, took the opportunity during a question session with Guillaume Faye to make known several historical facts relating to the specific issue of Jewish disloyalty. The footage then shows Duke being interrupted and subjected to foul language by Jewish social scientist Michael Hart, apparently the sole malcontent, who then abruptly departed from the venue. Duke at no point addressed Hart directly, nor did he make reference to any Jews in attendance. What Duke had in fact done was to break a prevailing taboo on the discussion of Jewish influence within that organization. This kind of reasoning certainly has a vague aesthetic appeal. In a movement that is all-too-often eaten up with division and fraternal conflict, there is something magnetic about an approach stripped down to the most homogenizing basics. And so, at the time, I recall giving Wolff’s argument some consideration, observing both the episode and its aftermath with great interest. Like countless concerned Whites, I was then on the outermost fringes of White advocacy — a ‘lurker’ in the common vernacular. For some time I had been aware that all was not well in the West. Most troubling was the evident, but painfully unaddressed, issue of White demographic decline. After familiarizing myself with enough of the facts, I became sympathetic to the core tenets of ‘the movement,’ and I read, watched, and listened to, as much of its material as possible. I sifted through this material, from the intellectually sublime to the frankly ridiculous, in a concerted effort to tear the psychological veil that the agents of Liberal Democracy and Cultural Marxism had cast over my mind, inhibiting my perception of the West’s unfolding cataclysm. But I was also entirely silent. I refrained from commenting on forums. I abstained, for a number of reasons, from becoming a member of political parties. In general, I stayed ‘off the grid’ in every sense of the term, and for a time contented myself with being a mere observer. The lurking phase of initiates into the movement, while ostensibly unproductive, can be a useful one. Busy in my career and at that time nurturing a newborn son, I was also occupying time with increasingly ambitious attempts to broaden my personal knowledge of relevant issues, ideas, personalities, and epochs. Cognitively, this was an exercise in starting from scratch. As far as locating and studying useful material and models, only a few morsels can today be retrieved intact from the ashes of the pyre of European culture and tradition. Having now raged for fifty years or more, the furnace has left little to those born after the 1960s. Nor will you find assistance in this endeavor from today’s schools, colleges, newspapers, fashionable groups or churches. Added to the paucity of support and resources, to be discovered scavenging among these ashes of the older culture is to attract the severest social opprobrium. The path of liberals and Leftists sparkles with cultural and material incentives, but the scorched-earth path of tradition is shrouded in scorn and lack of economic or professional opportunities. Undaunted, like all of you, I chose the latter. Furthermore, I began devoting an increasing amount of time to familiarizing myself with the many aspects of the most scorned of its deeper pathways — the one that leads to the ‘Jewish Question.’ When Wolff published his piece, I was still in the process of refining my own opinions, thoughts and judgments on the nature and extent of Jewish influence on the West. But I was sufficiently well enough into this process to ensure that my deliberations on ‘the Wolff approach’ to the issue of Jewish influence did not last long. Even at that early stage in my journey into White advocacy Wolff’s apologetic didn’t sit well with me at all. Most concerning was the ignorance, real or feigned, that Wolff displayed on the question of Jewish influence on the contemporary West. He wrote equivocally on the “role Jews may or may not have played in creating the crisis we face [emphasis added],” and doubted whether it was “possible to prove that Jewish influence derailed what used to be a healthy American racial consciousness.” All of this fed into the idea that the questions of racial consciousness and racial survival could, as Wolff basically suggested, be divorced from the ‘Jewish Question.’ I was then familiar enough with a considerably broad and deep range of historical, scholarly, and contemporary texts to recognize that the ‘Jewish Question’ was a matter of considerable fact rather than, as Wolff implied, one of as yet unsubstantiated conjecture. I was also by this time fairly clear in my own understanding that the issues of White racial survival and Jewish influence in the West were inextricable. If anything, I was incredulous that Wolff could argue otherwise. By 2006, when Wolff wrote his piece, there was certainly no shortage of modern “respectable” studies that offered radical but rigorous revisions of the Jewish past as well as insight into contemporary Jewish influence. Walt and Mearsheimer had been collating serious research on the open secret of the Israel Lobby’s influence on U.S. foreign policy since 2002. The 1990s had witnessed the publication of Kevin MacDonald’s trilogy of books examining Judaism as a group evolutionary strategy, as well as Albert Lindemann’s refreshingly honest Esau’s Tears: Modern anti-Semitism and the Rise of the Jews. Although MacDonald went further and was less shy in his conclusions, both offered trenchant, well-referenced critiques of the established patterns of Jewish historiography: the exaggeration or complete invention of aggression or atrocities; the ever-present trope of Jewish passivity and innocence; the failure to objectively analyze the nature and import of the Jewish economic profile; and the overwhelming tendency to present “anti-Semitism” as a viral psychological disease rather than a rational and materially motivated phenomenon. Both also implicitly or explicitly documented the mechanics and motivations behind Jewish political and intellectual interactions with Western governments and societies. Needless to say these works were suffocated as much as possible by the establishment and their impact on the public then was even more limited than it is now. Most predictably, Kevin MacDonald’s work was put on the rack by those scholars in the cozy and self-congratulatory “Jewish Studies” clique, who were shocked and horrified by the intrusion of the dissident trilogy. Rather than being conventional academic critiques, however, the excoriating treatment of MacDonald was as novel as it was disproportionate. Repudiations of his work by these mainly Jewish scholars struck me then, as they do now, for their intellectual bankruptcy. One of the harshest of MacDonald’s critics was Sander Gilman, chief guru of the “Jewish Studies” establishment and the author of such academically lightweight and dubious texts as Jewish Self-Hatred and Fat Boys: A Slim Book. Commenting on MacDonald’s endorsement of theories suggesting eugenic selection for intelligence in Jewish communities, Gilman argued only that it was “bizarre” that “such an argument” should appear in American scholarship “after the Shoah.” According to Gilman, who blankly denies the well-established fact that Ashkenazi Jews have above average IQs, “after the Shoah” such theories, facts and self-evident truths should be entirely taboo. In the furor that accompanied and followed the publication of MacDonald’s trilogy, the implication became clear that even within academia, as was the case in society as a whole, any straying from the received narratives of Jewish history and Jewish life was strictly taboo. Coupled with the fact that critical historical enquiry into the received narrative of “the Shoah” was also by this point in many European countries a legally protected taboo, rigorous analysis of Jewish history was therefore declared “off limits” on the basis of an alleged historical event that was itself “off limits” to critical analysis. Safely encased in ideological and legal bubble-wrap, the genres of Jewish history and “Jewish Studies” thus only scarcely resembled a genuine academic discipline. Given the suffocating nature of the universal taboo on discussing Jewish culture and politics, it came as a shock to see such an equivocal position on the Jewish Question being adopted by a leader of one of America’s most important and vital organizations serving to raise White racial consciousness. Wolff’s position struck me at the time as the imposition of the same old taboo, only for different reasons. This isn’t to say that I don’t believe that individual Jews, or even groups of Jews, can adopt a position of honesty and offer something to White advocacy. I’m thinking in particular of people like Gilad Atzmon, who have offered refreshingly honest takes on the racial community they were raised in. What is more questionable is the idea that the “usefulness” of an extremely small minority of individuals should demand that the much larger question of negative Jewish influence be neglected, expressed equivocally, or side-lined in order to make things more comfortable within the movement, or at least less “disgraceful” for some. Reviewing the footage of David Duke’s intervention in 2006 once more, I am only confirmed in my opinion that Duke was very calmly expressing frustration at the ongoing, and paradoxical, taboo on the Jewish Question within what was an ostensibly race-realist organization. It wasn’t so much that the elephant in the room was being ignored — it was that the elephant was actively destroying the room while we busied ourselves blaming it on an earthquake or some other cause. For a number of proffered reasons, the tendency to shroud the question of Jewish influence on Western society continues unabated in the wider political expression of nationalism and White advocacy. There are no existing nationalist European political parties that explicitly mention the specifics of Jewish influence, past or present, beyond occasional diluted references to Zionists. One of the most cited reasons for this taboo is the presence of restrictive legislation in Europe which protects Jews from discourse harmful to their interests. Legislation varies across Europe in its severity, but it is certainly restrictive across the board. However, it is not bullet-proof. Before its total collapse, the British National Party under Nick Griffin maintained an admirably sophisticated discourse on Zionist influence that stayed on the legal side of Britain’s Jewish-orchestrated speech-crime laws. Much of this content owed to the personal influence of Griffin, whose career and writings clearly illustrate an informed perspective on the nature and importance of Jewish influence on the West. Indeed, in the months prior to Griffin’s October 2014 exit from the party, the BNP was coming under growing scrutiny for its increasingly open and frequent criticism of “international Zionists” and “radical Jewish racism and supremacism.” In contrast to more muted periods during which the party made overtures to bourgeois “respectability,” throughout March and April 2014 there was a veritable hue and cry from Jews and the Left over the BNPs “Return to its anti-Semitic roots.” While not without difficulties under Griffin’s leadership, after his departure the BNP went into meltdown and its discourse became more timid on a range of topics. As the British political establishment conspires to squeeze the last breath from free speech (for more see Tobias Langdon’s discussion), the prospects for a revival of the Griffin-era anti-Zionist discourse look slim indeed. Organized Jewry will never abandon its assault on the West. It is managing to wage war on us and on the Palestinians quite successfully without the fools among us rushing to bend the knee for a few votes, or scraping the dregs of Jewish communities for a few token party members. Disregarding the absurdity of White ethno-nationalists and Jews finding common ground, they don’t need our support and we certainly don’t need theirs. In defense of the BNP, at least one could argue that its approach to the Jewish Question was tactical and cynical, if misguided. Other movements on the Right appear to be drinking their own Kool-Aid, and in the context of multiracial immigration and Islamic terror in Europe, ostensibly nationalist street movements like England’s English Defense League (EDL) have made a point of ostracizing “anti-Semitism” and maximizing their pro-Israel, pro-Jewish credentials. Like UKIP, having been utilized effectively to kill the BNP, the EDL has now largely been made redundant by its handlers; its media impact a pale reflection of what it was five or six years ago. 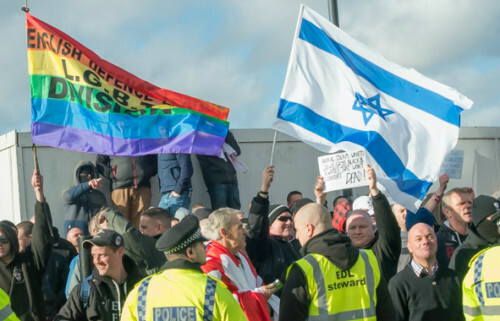 However, during its heyday EDL gatherings witnessed scores of Israeli and rainbow flags, boasting of Jewish and LGBT “divisions.” I recall seeing some images of these flags at EDL marches around this time and feeling a tremendous sense of disgust for the watered-down civic nationalism that the EDL appeared to be proud to advocate — a nationalism so terrified of being labelled prejudiced against any but the most easily-targeted of pernicious minorities that it formed little “divisions” just for its protected and cherished darlings. The EDL thus engaged in an exercise of “virtue signaling” to rival that of even the smuggest liberals.